Handforged in Sweden by very skilled hands, the Ekelund is an excellent all around Axe for the Woodsman and Bushcrafter. With a 20in shaft and 2lb head it has lots of power and precision, yet is still highly portable and packable. Using the Classic cutting head, with narrow profile and deep grind gives it great wood 'bite' when full swung, but the incut allows for closer work when more accuracy, or even delicacy, is required. Its a highly versitile tool. Hanforged using Swedish high carbon Steel, with a Hickory shaft and double wedge, it encompasses all thats is best about good quality axes. Head 2Lb with a 3 1/4in cutting face. Comes with leather head cover. Purchase through PayPal by using the "Add To Cart" button above or use the form below to order the Hultafors Ekelund Axe . 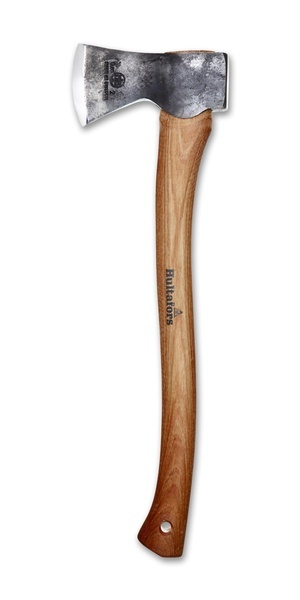 Feel free to contact us if you have any questions about the Hultafors Ekelund Axe .